This eye-opening, fact-filled book profiles the rise of the Net Generation, which is using digital technology to change the way individuals and society interact. Essential reading for parents, teachers, policy makers, marketers, business leaders, social activists, and others, Growing Up Digital makes a compelling distinction between the passive medium of television and explosion of interactive digital media, sparked by the computer and the Internet. Tapscott shows how children, empowered by new technology, are taking the reins from their boomer parents and making inroads into all areas of society, including our education system, the government, and economy. The result is a timely revealing look at our digital future that kids and adults will find both fascinating and instructive. Growing Up Digital offers an incisive and compellingly written look at the generation that will make it all happen. 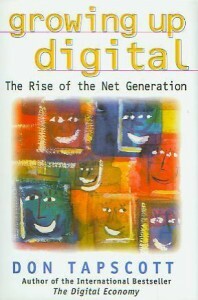 This breakthrough book takes us into a networked world where the Net Generation is clearly in the driver’s seat.